Mariner 10 was a robotic NASA space probe. It was launched on November 3, 1973, to fly by the planets Mercury and Venus. It passed Mercury three times and photographed much of it. Mariner 10 is no longer working today but is still orbiting the Sun. 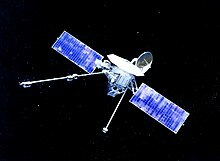 It was launched about two years after Mariner 9 and was the last spacecraft in the Mariner program. Mariner 10 was the first space probe sent to Mercury. ↑ "Mariner 10: In Depth". NASA. Retrieved 2016-02-20. This page was last changed on 6 March 2019, at 19:39.